Mel Blanc, the man behind the voices of Bugs Bunny, Porky Pig, Tweety Bird and Sylvester the cat, Yosemite Sam, and countless other Warner Brothers cartoon characters, is the subject of a special exhibit this month at the Oregon Jewish Museum in Portland. Called "That's All, Folks: The Mel Blanc Story", the exhibit chronicles the life of a man who has been called the first and best voice actor. He made it an art. His career spanned vaudeville, radio, movies and television starting in the late 1920s and continuing to this day, more than 20 years after his death. 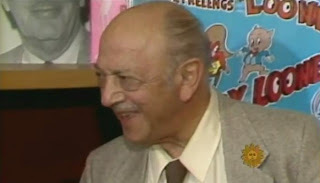 The exhibit follows the trajectory of Mel Blanc’s life from his youthful years in Portland to his remarkable Hollywood career as the voice behind more than 400 animated characters in over three thousand cartoons. Film, sound, photographs and memorabilia will entertain adults and children alike. So where did Blanc develop his aptitude for funny voices? He didn't have to go any further than his own neighborhood. Born in San Francisco in 1909 as Melvin Jerome Blank, he moved north with his family at the age of 6. His father owned several apparel businesses, and young Melvin spent his days running around south Portland, observing its residents, many of them Jews. Among the first people he befriended were the elderly Jewish couple who ran the local grocery; they spoke Yiddish, and the boy became fascinated with the strange dialect and its intonations. He learned to imitate it. It was, by his own admission, the first voice he ever performed. There were plenty of other patois for young Melvin to pick up. The neighborhood offered a lot to a kid with a good ear: Russian Jews lived alongside Italians, Germans, Mexicans, and Japanese. All of these dialects would one day come in handy. We're sure that our readers in Portland will visit the museum before the exhibit closes on September 11. We recognize that most readers live in other cities and countries and will not be able to attend, but technology lets us share a preview of the exhibit. In addition to the cartoon voices, Blanc was a regular on The Jack Benny Show, where he appeared in funny roles as a taxi driver, delivery man, and Mexican troubador. We've included a video clip of one of those appearances below. Enjoy! Si....Sy.....Sue was always our favorite routine!! !